Try as they might, the Sisters of Quiet Mercy are failing in their attempt to break Betty. Not only that, she’s decided it’s time to expedite her exit out of that hellhole. Her best chance for success is getting Ethel Muggs back on her side. This involves a touch of deceit to invoke jealousy and then locking Ethel into the Gargoyle King’s chamber for a few hours so she can detox from the Fizzle Rocks. When Betty returns to Ethel she’s back to her normal self and we see that this Gargoyle King is, in fact, just a cement statue of a gargoyle. Thankfully, this helps open Ethel’s eyes to the horror of the asylum and, together, Betty and Ethel work to get answers and get out. They start by grabbing Sister Woodhouse to get some answers about Gryphons & Gargoyles. According to Woodhouse, in times of old, bad girls were brought down to the chamber with the gargoyle statue and he would scare them into submission. Girls who were more delusional created a realm or game to cope with their fear, but it gave them focus and made them more complacent. Sister Woodhouse recognized the power of the game and said it was never supposed to leave the walls of the asylum and she has no idea how it got out. However, she won’t call the police or answer for her sins: she only answers to one person. With Sister Woodhouse’s keys in hand, Betty and Ethel try and get the girls to leave but as Sister Woodhouse predicted, they don’t want to. They feel safe in the asylum and are happy to live in fear of the Gargoyle King so Betty and Ethel decide to flip the game on its head and give the girls a Gryphon Queen to give them home. This comes in the form of game master Ethel telling them about a new quest where they have to escape and the Gargoyle King is dead but his minions are still alive. However, they can follow the Gryphon Queen (aka Betty all dressed up) to freedom. The plot works and the girls leave the asylum but have nowhere to go. At that moment, Betty’s mother Alice shows up and, hopefully, she’s got some room to take them in. 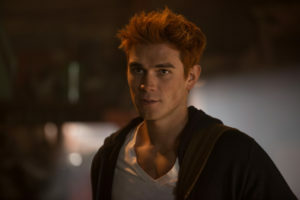 The tension between parents and siblings isn’t anything new in Riverdale but this week, all the families seem to be undergoing some major issues in addition to Betty’s mother leaving her at a house of horrors. We also find out that at one point in time, Gladys didn’t want Jughead to come and see her. Things are further complicated when she finds out her son is now the Serpent King – a lifestyle she never wanted for him and one she left Riverdale to get away from, even though it’s clear she’s not always on the up and up in her chop shop. I think it’s safe to say that the kids working for her in her garage are substitutes for Jughead as she does whatever she can to take care of them. Sounds kind of familiar, doesn’t it? To make matters worse on this somewhat awkward family reunion, Penny Peabody shows up looking for Archie. Thankfully, JB was at the ready with a slingshot and has amazing aim. Gladys did some form of interrogation on Penny (we can guess it’s nothing nice and clean) and the scariest thing we know is that the bounty isn’t just on Archie’s head: it’s also on the head of anyone who helps him. 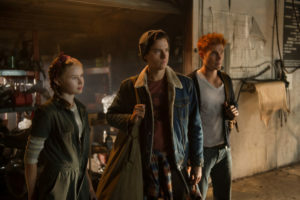 A clarifying talk between Jughead, Gladys, and Archie leads to Archie getting a ride to the border and Jughead going back home to FP. As it turns out, Gladys called Archie’s father, Fred, to give him the ride. This meant they got to say a proper goodbye and a newly brunette Archie was given a new companion to wander with: his dog Vegas. Things are a bit nastier between Veronica and her parents and Cheryl and her mother. All the trouble started when all the cheerleaders except Cheryl had a mass seizure at school. Veronica wakes up in bed to hear arguing that alludes to the fact that she wasn’t supposed to suffer a seizure. If that wasn’t weird enough, her parents want to ship her off to New York claiming she’s stressed about school and running two businesses, and the move will improve her health. But Veronica isn’t buying it, so she asks Reggie to put his ear to the ground and find out what he can. Apparently, Veronica’s father, Hiram, is pulling Jingle Jangle from the streets and is only making Fizzle Rocks now. He’s also giving it away for free to first-time buyers and it’s being sold by a new gang, the Gargoyles. Things take a turn for the worse when people in HAZMAT suits show up in Riverdale to take all of the “infected” girls. Veronica manages to escape and after conferring with Cheryl, decides it’s time to crash the parent/school conference to discuss what’s been going on. Veronica calls out her father saying the people in HAZMAT suits weren’t even from the Center For Disease Control and Prevention and he’s trying to get the school shut down so he can buy the property for cheap, just like he did with Southside High, which is now a drug factory with a prison as cover. Sadly, Hiram has an answer for everything and Veronica and Cheryl get dismissed. What’s more infuriating is Hiram telling Veronica she was right about everything and he wants her by his side to rule the kingdom he’s building. 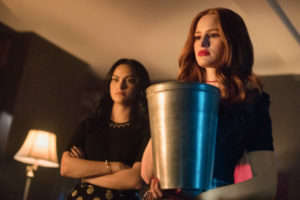 Meanwhile, Cheryl is thoroughly pissed that Hiram messed with her cheer squad and is out for answers and takes it out on her mother, Penelope, with an interrogation by syrup alongside Veronica. Penelope reveals that the gist of Hiram’s plans is to create a town where drugs and prostitution are not hidden in the shadows, or to quote Penelope, “A place where we can all pursue our various enterprises unmolested.” Thinking quick, Veronica and Cheryl recruit the RROTC members and storm the mayor’s office, hoping that Veronica’s mother, Hermione, hasn’t done the deed. But Veronica and company are too late and the town of Riverdale is now under quarantine. This means no one, including FP and Jughead, can come in and people like Betty and Alice, can’t get out. I guess Hiram’s been playing the long game and for now, he’s won.